“Reduced to extreme poverty, nearly 50 families had taken shelter on the embankment in last six months. During a recent visit to the locality, this correspondent was told by Nahida Akhter, 30, temporally living on the embankment in Halishahar, that once she had a happy family with a house at Charbhavat in South Hatia. Nahida said as they have no relatives in the port city, she and her husband with three children took shelter on the embankment and are living there in acute poverty for last two years. “As Bangladesh is facing the adverse impacts of extreme climate events, including cyclone, tidal surge, erosion, flood and erratic rainfall, migration rate from rural to urban areas has been increasing day by day. Most of the people are migrating from islands and char areas to other places in the country, particularly in cities and towns. About the recent trend of migration of displaced people, Sunil Chandra Das, who took shelter on the Patenga-Halishahar embankment nearly 30 years back after losing his house due to a tidal surge, said that when he migrated to Chittagong city from an island of the Bay of Bengal, only few families used to live on the coastal embankment. ‘But, now thousands of internally migrated people are living on the embankment after losing their homesteads due to natural disasters,’ he said. Locals said some 4,000 displaced people of over 1,000 families currently live on the coastal embankment of Chittagong, which creates immense economic pressure in the area. Without adequate livelihood options, most of these families live under the poverty line. According to experts, Bangladesh is frequently visited by natural disasters such as tropical cyclones, storm surges, floods, droughts, tornadoes, and nor’westers. Of these, tropical cyclones originating in the Bay of Bengal and associated storm surges are the most disastrous. Sea level rise, an increase in cyclone intensity, and consequent increases in storm surge heights will have disastrous effects on the deltaic country, which will force the people to migrate to urban areas in the coming days, adding to the number of people living below the poverty rate. According to the Intergovernmental Panel on Climate Change (IPCC), if the sea level will rise one meter due to global warming by 2050, the country’s one-third of land will go under the sea water. This tragedy is an old one, but not an unavoidable one. 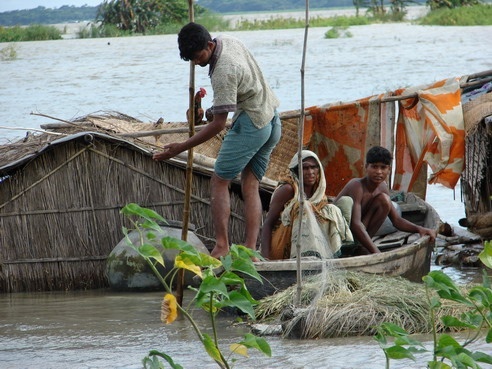 The natural world is not the main culprit for poverty or disaster in Bangladesh. The reason that so many poor people live precarious lives, the reason so many suffer on the edge of survival, is because of how wealth and power are organized under capitalism. The poor people of Bangladesh and other Third World countries are not valued as human beings by capitalism. Besides their value as producing cogs in the capitalist economic machine, poor peoples are mostly considered expendable by the capitalist system. Capitalism is a system organized around profit. Capitalism is not organized to serve the people or the Earth. Capitalism is irrational from the standpoint of balancing ecological and human needs. Instead, communities are not planned in harmony with the natural world nor are poor communities protected from such disasters. This irrationality is part of what Karl Marx called the anarchy of the capitalist mode of production. The reason that poor people lose their lives in such disasters is because capitalism does not value them enough to create the proper infrastructure to prevent such problems. The reality is that such disasters are the result of hundreds of years of neglect inflicted by the wealthy, the feudalists, the capitalists, the imperialists, the First World, against the proletarian and the poor classes, against the Third World. The reality is that natural disasters are as much man-made as natural. Such disasters are yet another crime by the rich against the poor. The reformists, global institutions, the reactionary state, the capitalists refuse to place the blame on capitalism itself. Instead they repeat the same old lies. They say that the system can be fixed. The reality is that they will never fix their system because they are the system. The nature of capitalism is to serve the wealthy, not the poor. From their point of view, from the standpoint of the wealthy, capitalism is working fine even if poor peoples are slaughtered. Revolution is the real solution. Only by empowering the poor peoples against the wealthy peoples, only by empowering the Third World against the First World, can we hope to create a society that truly serves the people, a society that begins to correct the hundreds of years of neglect and maldevelopment that puts many poor communities in ecological danger. Only by applying the most advanced revolutionary science of Leading Light Communism can we hope to create a new world of global equality, justice, sustainability. All power to the poor peoples of the Third World!